There are always times in our lives when we have to trust other. It starts with parents, extends to other members of the family, then friends come into the equation and ultimately workmates. There are few business that exist these days which don't operate in teams of some sort. The term supervisor has been replaced by team leader and you all have to have complete trust in each other to work towards the common goal of making the company you work for a resounding success. If you feel the need to spread the word out to your workmates of how you trust them as teammates then these corporate ecards will do it for you in a quick and succinct manner. The image on the e cards is of a stunning sunset over a cove, with the water calm and peaceful. In other words, nature working s a team. 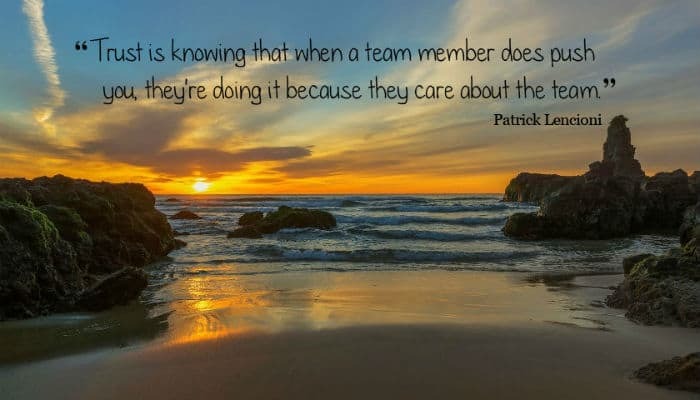 The message that uses this stunning scene as a backdrop is “Trust is knowing that when a team member does push you they're doing it because they care about the team”. Wise words from Patrick Lencioni, an American businessman who wrote many books on the subject. You can add a few words of your own too if you feel the need or leave it as it is, the choice is yours. We would love you to consider our electronic holiday cards for business this coming Christmas holiday season, pop over and see how we can wow your client base.